I've fallen a bit behind some of the other bloggers who are participating in this challenge, so I thought I'd do a double post day. This one should be short and sweet. 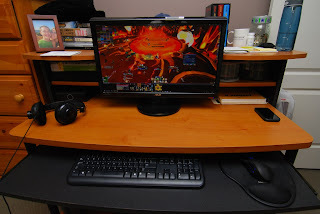 This is where I play WoW 99% of the time. The other 1% is when I'm house sitting. Pictured is my lovely 24" Asus display, my Razer Naga mouse and Razer headphones. I love them both. My keyboard was $15 and it is fantastic. Also pictured: an image of my girlfriend and me, on a trip we took to Hawaii 2 years ago. Also also pictured: the box with my SSD in it and my WoW install discs. Am sadface. That's another post. I was watching/listening to @Devolore's HRag progression stream while cleaning today. Anyway, this is my desk, in all its glory. I hope you have enjoyed this glimpse into my glamorous life.